Something a bit light hearted today. People often seem to see Jesus' picture in bizarre places but how about finding a comedians face in a pie crust! 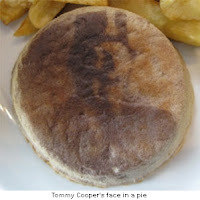 Anyway, chip shop owner Crad Jones was getting stuck into his pie and chips (that's fries in the USA) when he saw an image of Tommy Cooper in his pie. He'd eaten hundreds and hundreds of pies previously but this was a first. Mr Jones said, "The comparison was amazing. 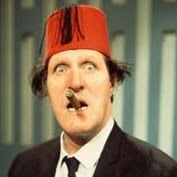 It was definitely Tommy Cooper. I called my daughter over and she recognised it as Tommy Cooper too. I got the pictures because I thought no-one would believe me." Now as if anyone wouldn't! He went on to say how this exciting find came about, "I was about to eat my lunch in the shop, as I normally do. I got my Peter’s pie, which I always have with chips and peas, and noticed the resemblance of Tommy Cooper on the bottom of it." A man walked into the doctors, he said 'I've hurt my arm in several places'. The doctor said 'well don't go there any more'. Two fish in a tank, one says to the other - you drive I'll man the guns. I cleaned the attic with the wife the other day. Now I can’t get the cobwebs out of her hair. A man went into a bar. He went 'Ouch'. It was an iron bar. Hilarious! It really does look like him. tommy was great i remember watching the tv show where he died on stage and everyone thought it was part of his act. very sad at the time. OMG I love his ridiculous jokes - I laughed out loud to a couple of em! Absolute classics - I loved Tommy. The shrink says, "Well, I can clearly see you're nuts". 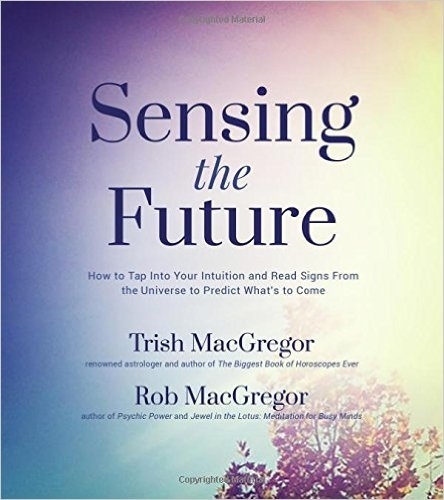 "Doctor, I can't pronounce my F's, T's and H's"
I said, "Sure, you look great, the world's yours, go for it!" Glen: Great stuff - Tommy still makes me laugh, I love that sense of humour. Thanks!